Today’s post is our first guest blog post and we are excited about it. Over the last 12 months we have been exposed to many areas of the financial services industry. There’s been a few connections within the advisory community that stand out. Today’s guest post is by one of those connections. Justin Castelli, the founder of RL Wealth Management and creator of the All About Your Benjamins blog, was kind enough to write a few words on the Value of a Financial Advisor. His take is worth the read as it covers the “other things” that advisors do. His blog is a bookmark of ours and I encourage all investors to check it out. He is building a practice that’s positively impacting his clients and I think you will see that in the post below – enjoy! You never know where the inspiration for a blog post might come from; this morning a conversation at the gym inspired this post discussing the perceived and real value financial advisors provide to their clients. I think it is safe to say, for most, the perceived value of financial advisors is centered around portfolio management. Typically, the initial reason individuals reach out to a financial advisor is because of some investment need–a 401(k) rollover, IRA funding, poor performance, etc, and while financial advisors provide value through portfolio management, the real value provided comes through all of the “other things” they do. During our pre-WOD (“workout of the day” for non-CrossFitters) warm up, a friend asked my opinion of a robo-advisor he was using for some of his investments. Initially, I told him the robo-advisor he was using is one of the popular ones and will probably do a good job for him over the years, but his robo-advisor was not really an advisor–it was an allocator, a robo-allocator. I continued to explain if all he needed was portfolio management, he was in a great place. Thanks to technology, portfolio management is becoming a commodity, and there was no reason for him to pay an advisor more than what his robo-advisor was charging him because he’d be overpaying for just portfolio manager. There is an increasing number of robo-advisors, fund companies like Vanguard and Registered Investment Adviser (RIA) firms creating low-cost investment management programs, leaving financial advisors with portfolio management as their only trick with their days numbered. Investors are demanding, as they should, more than portfolio management for the fees they are paying to financial advisors. If the only need is portfolio management, there are plenty of options available; a low-cost diversified portfolio of ETFs and mutual funds is no longer going to cut it. So, if portfolio management is no longer the source of a financial advisor’s value, what is? The answer is simple, yet complex at the same time. As I mentioned earlier, the value provided by a financial advisor comes from the “other things”–allow me to explain what I mean by “other things”. A 2016 study by Vanguard (you can read it here), concluded the single factor providing the greatest value added by advisors is behavioral coaching. I’ve included a chart showing the breakdown of an advisor’s value, and you’ll notice portfolio management factors like rebalancing, keeping expenses low, and asset-allocation have value, but behavioral coaching brings the most. Not only does behavioral coaching bring the most value, it also the factor that cannot be replicated by robo-advisors and technology–yet. Behavioral management/coaching comes in a variety of forms. For some, it is assistance with creating a budget and guidance to stick to it. For some, it is an education about an investment strategy and the reassurance to adhere to the strategy when the markets decline. In addition to helping clients develop responsible habits, financial advisors also help clients overcome a number of investment biases. If you are not familiar with the famous Dalbar Study on investor performance, I’ve included a chart below which illustrates how poor investment behavior and investment biases impact investment performance. 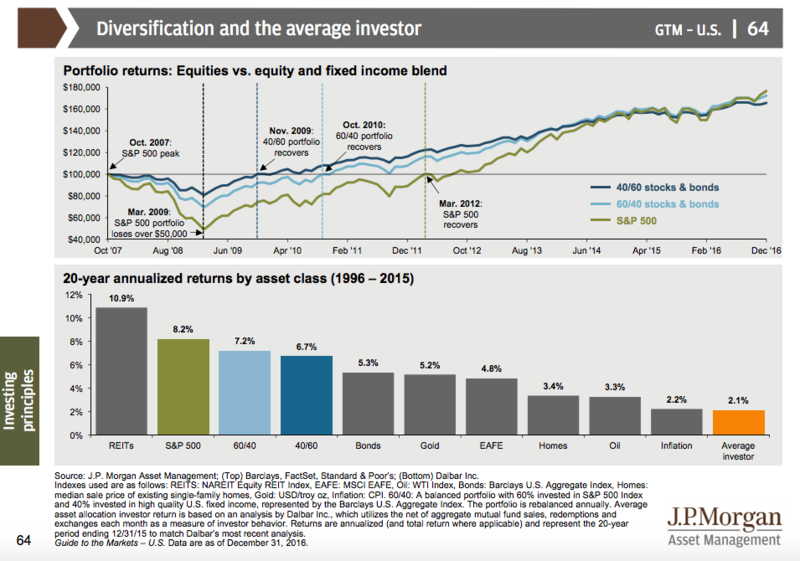 As you can see, thanks to poor investor behavior and habits, the average investor significantly underperforms a 60/40 portfolio, and they even underperform a conservative 40/60 portfolio. By working with a financial advisor to create and understand an investment strategy, along with the guidance from the advisor to stick with the strategy, investors have a better chance at avoiding a panic sale at the bottom of the market, overinvesting at a market top (FOMO), chasing returns, not being properly diversified, and the list goes on. Financial advisors still impact client portfolios, but it comes from behavior management more than the portfolio management. While investments show up in a financial plan, a comprehensive financial plan also addresses insurance, estate, tax, retirement, and college planning. It is in financial planning where the financial advisor separates himself from the robo-advisor/allocators. It takes the coordination of multiple facets of a client’s life to create, implement and monitor a financial plan. And, not only does the financial advisor create, implement and monitor the financial plan, but he makes adjustments when life happens–and it will. A financial plan is a fluid document; it will change multiple times over time, sometimes because of choice, and sometimes because life throws curveballs. Financial advisors have the experience and expertise to provide value to their clients by adjusting the financial plan to keep them moving forward. Are you aware there are multiple strategies for taking Social Security that could lead to receiving tens, if not, hundreds of thousands of dollars more in income over a lifetime? Or, did you know that Medicare premiums for high earners are determined by the income reported on your tax return from 2 years prior? It’s your financial advisor’s job to know these types of things. And while these example may apply to retirees, there are plenty of examples for younger individuals…potential tax advantages of a state-sponsored 529 plan, the use of Roth conversions, and tax-loss harvesting are just a few for the Millennials. Let’s face it, there are only so many hours in the day. You cannot be an expert in everything, and unless you are interested in finance to the extent you would enjoy keeping up with all of the changes that happen in fields that apply to financial planning, a financial advisor provides great value by helping make sure you don’t miss out on something, or make a decision that will have a negative impact for you. Not only will a financial advisor keep you accountable with your budget and saving, but a financial advisor will keep you accountable in areas you may want to ignore. A financial advisor will help address risks associated with death or disability–everyone’s favorite subjects; ignoring these risks leaves a family open to financial devastation by a death, or the inability to earn an income due to a disability. Not only is the family subject to financial risks, but it also runs the risk of allowing the legal system to determine guardianship of minor in the event of the loss of both parents. The conversations surrounding these risks are uncomfortable, and without the encouragement of a financial advisor to discuss them, they often remain unaddressed. Financial advisors can help determine the appropriate type of protection for your family and most importantly, provide the accountability to make sure you actually do it. These are just a few examples of the ways advisors provide value through the “other things”. 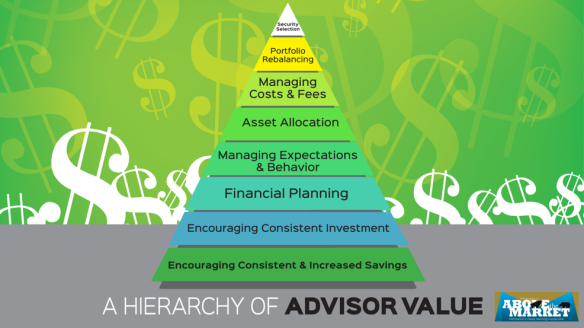 I want to leave you with a visual from Bob Seawright; in his post on February 12, 2016 Bob shared his “Hierarchy of Advisor Value”. It should come as no surprise the factors related to portfolio management are found at the top of the pyramid, in the smallest sections and far away from the foundation. If you have the time, I encourage you to read the entire post here. While portfolio management often brings investors into financial advisors’ offices, it won’t be the reason they stay. The true value of a financial advisor comes in a variety of “other things” that will be different for everyone. What “other things” is your financial advisor doing for you?